I had a rather annoying start to the day yesterday. Food-wise that is. It started with a failed attempt at making Vietnamese egg coffee at breakfast, followed by a messed up dalia khichri episode during lunch all thanks to a leaky pressure cooker gasket. I was getting a bit jittery by this time. My cousin was coming home for dinner. What if it was one of those days when everything went wrong?! And, I am one of those people, who would kill myself in the kitchen slaving over a complex recipe just to see that OMG WOW expression on the faces of my guests! Ummm, yes, I can be that lame. But, it seemed pretty pointless to cry to cry over spilled milk - figuratively speaking, of course (I did not spill milk yesterday! ), and so I did what I have done since childhood - when faced with tough decisions and hardships, hit the bed! There's nothing like a satisfying nap to get a fresh start on a problem situation. When I woke up, I knew exactly what I needed to do. I chucked the fancy-smancy 3-course meal ideas I had planned upon, and decided to stick with what I understand best. Curry, of course. 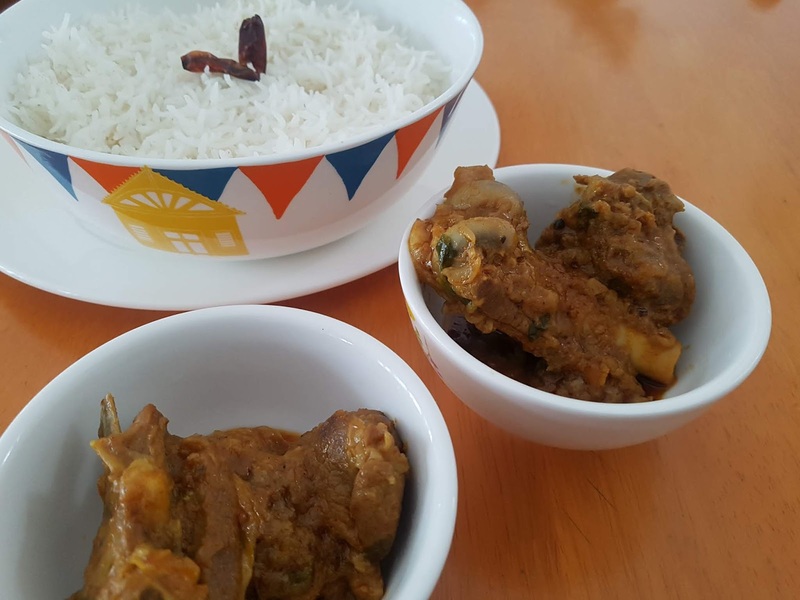 The last time I had made lal maas, I had tried a healthy rendition of the recipe, and realized some recipes you DON'T mess with! You cannot cook a bland, oil-free lal maas!! This was soon after my trip to Jodhpur, where I had tried the dish for the first time. Smack in the middle of the gorgeous Mehrangarh Fort, my meal at Chokelao Mehal restaurant was unforgettable. And, just like that overcast afternoon, I wanted a fiery red curry and no more culinary faux pad for the day. And for me, third time was a charm. Things went as per plan. The lal maas was finger-licking good! Rich, flavourful, and robust. The sweetness from the ghee along with the fiery dried chilly is to die for. Really! It's just that good! Best enjoyed with a plate of steaming hot rice, or freshly made tawa rotis. Equipment: Use a pot with a tight lid for this recipe. Before you start, soak the dry red chilies in a bit of water and allow them to soften. Also mix the dry spices with the curd and keep aside. Add the mutton and fry for a few minutes until you see some colour on the meat. Add the spiced curd and mix well with the mutton. You might want to turn off the flame as you do it because adding curd to a hot pot can lead to curdling. Cook this on low to medium heat until all the moisture from the curd has evaporated. The oil will float to the top and edge of the pot at this point. This process should takes around 15 minutes or so. Then add warm water and cover the pot tightly with a lid. Allow to simmer for 20 minutes. Taste for seasoning and adjust if needed. When the oil separates and the gravy is thick, turn off the heat. Add chopped coriander leaves to garnish.